It's still winter, evidenced by the snow on the ground today. It's not really the most suitable weather for getting a garden ready, so growing indoors (or in a greenhouse) is really the only option. Fortunately, I have space in my house to start a lot of my plants indoors, and I hope that in the next couple of weeks, the greenhouse I'm constructing will be complete. 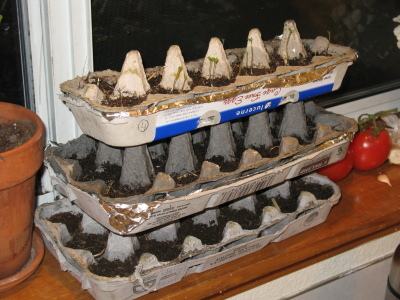 12- and 18-cell egg cartons make great seed beds, and they appear to hold up to at least a low level of stacking, which helps make better use of the space. In these beds, I have romaine lettuce, lemon cucumbers, spanish jumbo onions, and cherry tomatoes. Here's a close-up shot of the romaine lettuce. They are adorable. Once they're big enough, I want to get one of those half-barrels to set on my back porch to have easy access, and to make it more difficult for rabbits to get into it. Also, if I catch a rabbit (and I mean actually capture it), I will eat it. 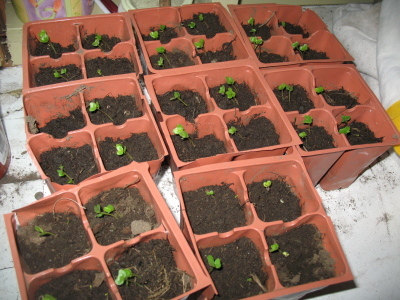 These are broccoli sprouts that my 5-year old daughter and I seeded at the end of January. These plants are a second-generation crop, which is kind of exciting for me. I had the broccoli growing in this multi-cell planter, but I also threw a bunch of seeds in the broccoli bed out in my garden. I was curious to see how well those seeds would hold up to the cold, as compared to the seeds in this planter (which I covered every night to prevent freezing). As it turns out, the ones in my garden are doing just fine -- the freezing temperatures don't seem to be an issue for them. Even so, having some in a planter is kind of fun. 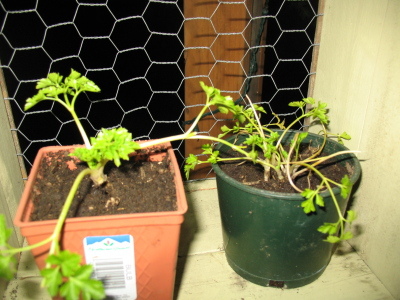 I've taken some of the parsley out of my parsley bed and put them into little planters. When they are brought indoors and are warm, the leaves open up much flatter, and they're really quite pretty. They happen to make excellent desk plants. Because I don't have a steady supply of egg cartons, I stopped by the local Home Depot and picked up three 72-cell "mini greenhouse" trays. 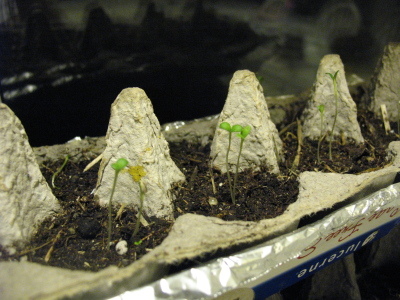 The come with peat-moss pellets which expand when you add water, and are designed to hold a couple of seeds each. 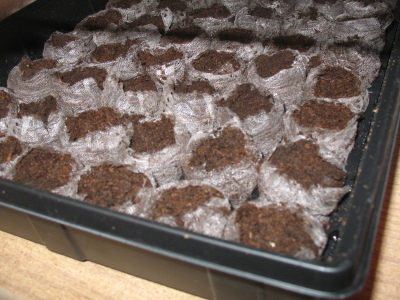 The fact that they come with a plastic cover (making the greenhouse) allows the trays to hold in heat and moisture. I don't know how well they'd hold up to freezing temperatures, so I'm keeping them inside for now... but the moisture-retaining feature is useful. With our central gas heating, the air dries out in our house very quickly, so my egg-carton trays require a lot of watering. In other gardening news, I'm building up a garden website that'll let me easily track the plants growing in my garden. I'll create it to allow other people to log in and build up their own gardening database, and hopefully make it useful and collaborative, etc., etc. We'll see how that goes.